Why’s It Important to Explore Dental Implants in Costa Mesa? If you’ve recently lost a permanent tooth, it may have initially frightened you but after a while, that scary feeling faded. Although it’s become harder to eat the foods you love, you’ve adjusted to missing that component of your smile. Most people can adapt to even unfortunate situations, but that doesn’t mean that you should neglect the fact that missing teeth can negatively affect your dental and overall health. In fact, your dentist at Advanced Dental Care, Dr. Jeremy B. Jorgenson, offers great teeth replacement options for those wishing to restore their optimal oral health: dental implants in Costa Mesa. Believe it or not, missing teeth is more common among Americans than not. According to the American College of Prosthodontists, about 23 million Americans are completely edentulous (lacking teeth) and 12 million are edentulous in one arch of their mouth. Its apparent that tooth loss isn’t uncommon and there are many ways to lose your teeth other than just bad oral health. No matter the reason, it’s important to replace them for these reasons. Your jawbone density can deteriorate. Your jawbone is stimulated by healthy tooth roots that promote blood flow. When they suddenly become missing, this area of your jaw along with surrounding areas will begin to deteriorate. You can also suffer from premature aging in your face. Your remaining teeth will start to shift places. Your remaining teeth can begin to shift and become crooked or overlapping, making it more difficult to clean. This could lead to tooth decay, cavities, or even dental diseases. Finally, your jaws could be affected. You will be at higher risk for developing painful TMJ disorder. You can’t enjoy the foods your body loves. The loss of even a single tooth can greatly affect your eating habits. Patients dealing with these problems tend to eat easily chewable foods—in most cases, these foods end up being highly processed and unhealthy for the rest of your body. Basically, you’re more at risk for food-induced health diseases because these foods are lower in nutritional value. Sometimes, some patients experience difficulties just speaking normally, especially if they are missing a front tooth. This can negatively affect how you feel about yourself and your ability to present yourself confidently. Whether you want to face this fact or not, missing teeth can also change how others perceive you. If you’ve been looking for tooth replacement options, many resources may have pointed you to traditional replacements like dentures. Yes, dentures in Costa Mesa can be a good way to replace several teeth in various places of your mouth (partial) or a full arch (complete), but this only replaces the visible portion of your missing teeth. What about the other important half of your tooth—the root? Your tooth root stimulates your jawbone, keeping it full and healthy. Without one, patients experience bone deterioration over time, leading to an increased risk of additional tooth loss or a sunken facial appearance. Thankfully, dental implants in Costa Mesa replicate the entire structure of a tooth, preserving and encouraging the growth of new bone tissue. Dental implants can help to rejuvenate your entire smile from root to crown. And luckily, you can combine popular tooth replacement options like dentures, bridges, and crowns with dental implants to create a life-long tooth replacement. 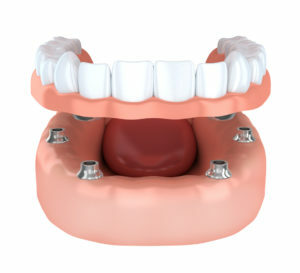 Dental implants are the next best thing to natural teeth! Are you ready to replace the missing parts of your smile? Don’t just replace the visible portion, consider your long term oral health. It’s easy to get started with the dental implant process. Just give us a call and we will schedule the next available appointment for Dental Implants in Costa Mesa! Comments Off on Why’s It Important to Explore Dental Implants in Costa Mesa?